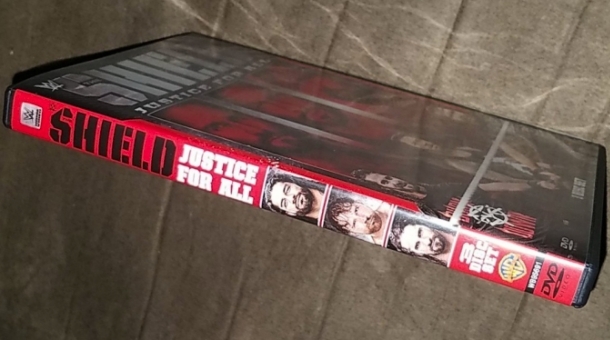 With a new month comes a new WWE DVD and this one is already about to hit stores; “The Shield – Justice for All” will release to UK fans exactly one week from today (£24.99; Amazon.co.uk) and is set to follow to the USA next Tuesday ($18.99; Amazon.com). 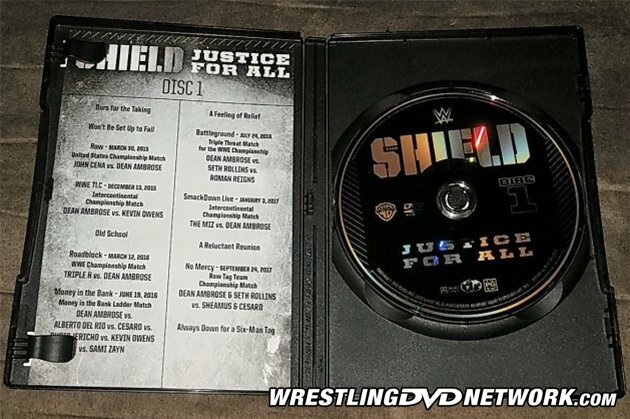 Before then, here at WrestlingDVDNetwork.com we’ve got a exclusive sneak peek in the video above – introduced by Dean Ambrose on a handheld camera in classic Shield style – and pre-release photos of the final product we’ll be adding to our collections next week. “The Shield – Justice for All” will be formatted as a compilation of 18 matches and 12 newly-filmed interview segments all involving Shield members “The Lunatic Fringe” Dean Ambrose, Seth “Freakin'” Rollins and “The Big Dog” Roman Reigns. Ambrose takes the first disc with matches and interviews focused on him, while Seth takes the second and Reigns the third. 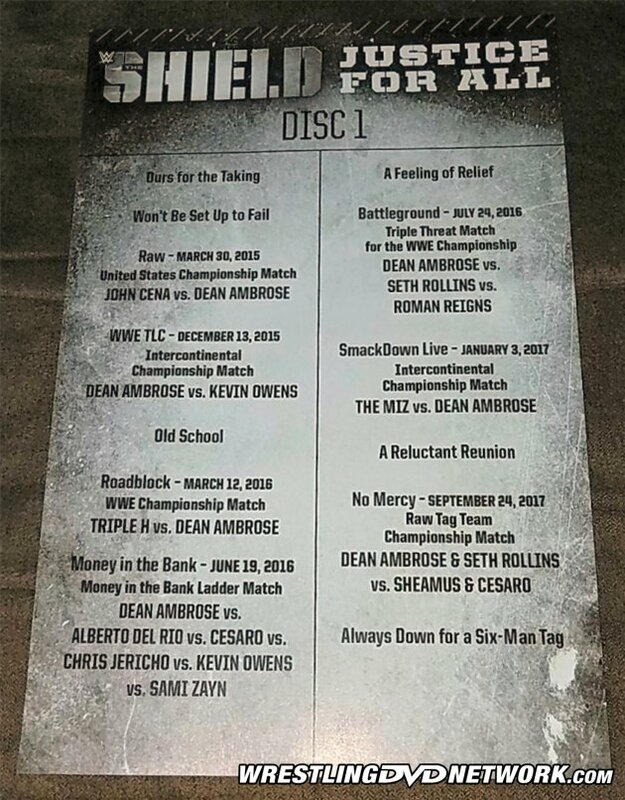 This will be WWE’s second Shield DVD released to date with the first being “Destruction of The Shield” which you may recall buying back in 2014. This new one will continue where the original title left off, presenting the trio’s greatest matches since 2015 both as a team and as singles stars, including their many individual successes and most memorable moments from the Shield reunion last year. Just a handful of the bouts featured are Dean Ambrose vs. Triple H from Roadblock, Seth Rollins and Ambrose defending their tag titles against Sheamus and Cesaro from No Mercy, Seth’s Rollins entire Gauntlet Match from RAW, and Roman Reigns vs. The Undertaker from WrestleMania. Everything combined that’s 8 hours and 45 minutes of content! We can confirm that the U.S. release packaging for the 3-disc set is once again the slimmer Amaray style which replaced the Digipaks earlier this year. A paper insert is found inside the case which details the full content of the discs, while those discs are again ‘stacked’ together in one holder. Let’s take a look! Thanks goes out to WDN reader @jayjayrock206 for the pics. DISC 1: 2 hours and 53 minutes. DISC 2: 2 hours and 59 minutes. DISC 3: 2 hours and 54 minutes. – UK/Europe: Next Monday! Pre-order a copy of the new Shield DVD now on Amazon.co.uk. – USA: Next Tuesday! Pre-order your copy of the new Shield DVD right now here on Amazon.com. – Australia: September 19th. Your pre-order opportunity just went live at Madman.com.au. I’m glad they put the Seth Portion of the Gauntlet Match from Raw on this set.I was there to see it and he put on one of the best performances I’ve ever seen from a Wrestler live. I’m surprised it doesn’t show Evolution’s reunion and their beatdown of Rollins, Reigns and Ambrose. That chapter title on Disc 3 is hilarious: “It All Felt Perfect”. Literally nothing has been perfect about Reigns’ push. Most of this set features them in non Shield matches while The Shield fought together as a 2 or 3 man team. It’s kinda why the set doesn’t make complete sense imho. Had they waited a little bit longer, could’ve added since a Shield set the tag match or matches from RAW earlier this year where Rollins teamed with Reigns either with or w/JJordan and the TLC Handicap involving Kurt Angle even though it honestly wasn’t the best match and was more of an overbooked match. 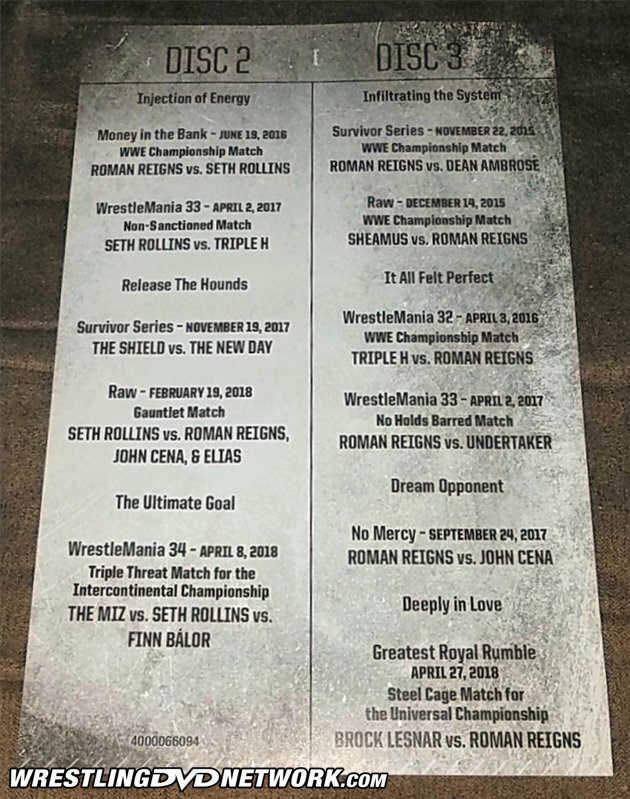 Also instead of the singles matches like Reigns vs Lesnar and others except the BIG matches like Reigns’ victories over Taker and Cena, the 3 members in that 3 Way for some examples,replacing the non Shield matches w/ the matches & segments leading up to the Rollins/Ambrose tag from SSlam would’ve to me made more sense since that was the start of the Shield reunion which unless I’m wrong is the theme/focus of this set. Will the Seth Rollin’s Gauntlet Match be the full 1hr 30mins match? I’m assuming so as there is only 5 matches on Disc 2, which is the disc that features the gauntlet. It wouldn’t make sense though because he wasn’t in the whole match. I think only what he was involved in is shown. Okay, maybe then. I suppose all of the Undertaker entrance and “retirement” rubbish takes up a lot of time in that disc too. Hey guys, our info says that the match here on the DVD runs for about 46 minutes (no commercials remember). It stops when Seth has been eliminated and gets a standing ovation. Hey. Might be a WWE error and idk if this has been addressed yet but according to the screenshot above, the matches are out of order as the Seth vs HHH, Shield vs New Day, the Gauntlet & WM34 3 Way IC Title match are on D2 while D3 has Reigns vs Taker, Cena, Lesnar. I’m a big WWE collector and typically the content on the discs are in the originally aired chronological order so if this out of order is how it’ll actually be for The Shield set, first time for me. Then again first time for everything as the saying goes. That would be because one disc is devoted to Ambrose matches/moments and his interview, one to Rollins and one to Reigns so they are in chronological order but it’s per disc rather than across the whole set. Ah ok I see. Makes sense then. Thanks. that’s because each disc has its focus on one particular member. The whole match would make sense for a Strowman aet as unless I’m not remembering it correctly he won the Gauntlet match. Makes sense thay it stops after Rollins is eliminated, I suppose. Not very satisfying to watch without an ending though! I understand that side of it. Do u have The Network? Can watch the whole match there and in better than dvd quality too. Plus it kicked off that episode of RAW so not like u have to skip around & forward through till u find it.